The composer John Adams manages to mine historical events into atypical and unexplored operatic material. His 2005 opera Doctor Atomic centered on physicist J. Robert Oppenheimer’s development of the atomic bomb and the eventual association with the Manhattan Project. With Nixon in China, Adams, along with librettist Alice Goodman, have chosen a specific event and created an important, however challenging, theatrical study in world politics. Lasting just only a few days, a visit by Richard Nixon to Beijing, China, for a meeting with Chairman Mao in February 1972 would eventually alter the course of international relations between the U.S. and China long afterwards. Such an interesting and well-publicized meeting between the two leaders automatically incites theatrical fodder, no less for an opera. A new production of an ambivalent Nixon in China was seen at an afternoon screening that was transmitted live in HD from the Metropolitan Opera. This contemporary work was born in a groundbreaking premiere at Houston Grand Opera in 1987, and it seems it has remained thought-provoking and undiminished after all these years. In writing his musical scores, Adams prefers to intellectualize the symphonic range with complex and dissonant tempos. The sounds that listeners hear is not the traditional melodies opera-goers are accustomed to hearing, they are the sounds that prick the ears in a peculiar way, making you subtly aware of how progressively and introspectively they sound. Patience is a virtue while trying to get through the first act. 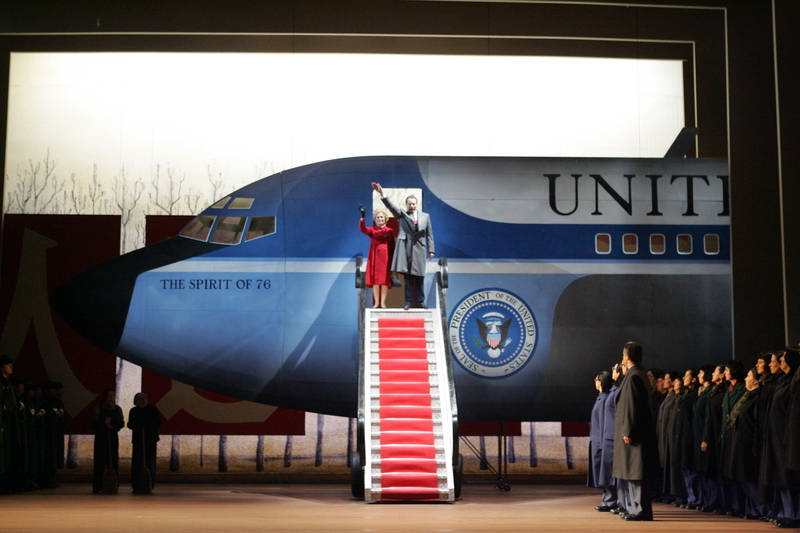 The opera opens with a group of service contingents awaiting the arrival of the plane carrying President Nixon, the First Lady and Henry Kissinger. When we first see the emlematic shape of The Spirit of ’76 descend upon the stage, it is an iconic image, a moment that director Peter Sellars knows how to drum up for maximum potency. Many stretches of longstanding glances and poses add dramatic weight and tension, and after so long, it becomes tedious. Adams’ score plods along serviceably, but it is Goodman’s libretto that becomes questionable. She has the characters repeat their dialogue in a repetitive refrain that you wonder if it’s all just filler. James Maddalena portrays Nixon with striking similarities of mannerisms and speech. But in the hands of Goodman’s text, having Maddelena repeatedly sing the same refrain several times as Nixon makes his grand entrance comes across as a mechanical robot gone awry. True it’s a rhythmic element in a contemporary score meant for emphasis, however, it doesn’t add anything new or further the action. It’s meant to bide its time in this 3 1/2 hour opera. Sellars also has the cast stand in photographic poses (as if to acknowledge the historic news images) while waiting to catch up with Adams’ array of abstruse melodies. Janis Kelly plays Pat Nixon in an affecting and graceful performance as Act II opens. She contemplates ironically how the Chinese culture share the same political ideals as her own Republican party. Remarking on a jade elephant sculpture at a souvenir factory tour, she states that the elephant is her party symbol and how prophetic the Chinese mass manufacture the object for all to remember. Choreographer Mark Morris essentially has all of the next scene to himself. As the Nixons attend and watch a performance of an accomplished Chinese ballet devised by Mao’s wife Chiang Ch’ing, they are enraptured, as we are, with the beauty and art of the movement. But as the ballet turns dark and violent, the First Lady can’t help herself but be involved in the ballet and prevent the further onstage torture of the young peasant dancer. With this extended ballet sequence, Morris has really showcased himself with choreography of the highest order. His extremely skillful dancers moved lovingly and beautifully in this Chinese ballet called The Red Detachment of Women. Making up for the sluggish pace of Act I, it was as if Sellars handed over the opera entirely to Morris, creating the only major highlight worth seeing in this opera. Never mind that, just have Morris branch off into his own separate evening based on this gorgeous piece. Kudos to Kunya Ramicova for recreating the period costumes and exacting color schemes for Pat Nixon’s wardrobe. The historical detail afforded by Sellars is worth seeing, but it is the conducting by Adams of his own score by the fine Met Opera Orchestra that sometimes bogs things down. Most of the creative team has remained since its world premiere in Houston and someone could have at least suggested a quickening of the music. Seeing the Met Operas live in HD has its benefits of affordability and local showings, of course, but the cinematic closeups are key to this particular story for seeing in detail the carefully crafted wigs and the calculated facial expressions of pivotal key characters. Plus a glimpse of the live backstage action as the stage is reassembled for the next act can be fascinating for viewers. More insight is gained on character development during interviews with cast members and various show designers. But one odd moment arrived at the sight of director Peter Sellars. Looking delighted to have his close-up on camera, he appeared to have come directly from a bad cross-breeding experiment at the Met’s costume shop. With shockheaded hair, Sellars was trying to blend in by looking like a madly eccentric scientist with your Asian grandmother’s pearls and your old uncle’s pastel-colored 197o’s designer thrift shirt.